*Judging a poetry competition–both a fun and challenging job. I love reading what creative minds come up with! *Editing 2 anthologies, “Re-Launch” and “Re-Quest” for Pole to Pole Publishing. And I will be reading for 2 more anthologies (“Re-Terrify” and “Re-Enchanted”) shortly. *Finishing a novel, adding to 2 in-progress short story collections, and working on a nonfiction book. *Writing several short stories and poems for anthologies or magazines. *Thinning the book herd. (My bookshelves are sagging dangerously low). *Putting together a bibliography of my writing and illustrations – then, entering the speculative work into http://isfdb.org Plus, if the publication qualifies, adding it to my listing on Poets & Writers data base. *Working on genealogy–and putting together several books based on that information. Yes, I know these publications won’t be “best-sellers,” but it’s a nice way to preserve the information and make it available to family members and other interested people. And I have no “time limit” on these books — as more information trickles in and I want to include as much as possible. (Librarians be warned, I will need help in doing the research to “ground” these historical accounts in history). *Knitting 30-plus scarf & hat sets by Christmas for daughters (I do call my daughters-in-law, “daughters,” too, because they are dear to me), sisters, nieces, etc. I was given a huge amount of lovely yarn, and I’m aiming to use up much of it in the process. Plus, knitting at least a dozen men’s hats for sons, nephews, brothers-in-law, etc. for Christmas. *Then, there is family: time spent with husband, kids, grandkids, friends, my mom and other family members. And art – I want to paint at least 2 new pieces of cover art this summer. And visits – I’ve fallen behind on my visits due to a 2017 and 2016 filled with trips to NC and SC to help older relatives who were dying. Wait, I’ve forgotten gardening! My gardens so need work. And the birds – feeders need to be repaired or replaced and birdhouses need to be hung. I could (and should) go on. But I hope you get the idea. I encourage you to look at your life. List what you are doing and what goals you can set for yourself. Can’t think of anything to do? Check out the volunteer opportunities in your area. I challenge you to astound yourself! In an attempt to finish many incomplete projects, I’ve set monthly goals for myself. So, how am I doing on the April and May 2016 goals I set forth on April 1st? 1-Complete my science fiction novelette (such a charming word!) and get it into the hands of my publisher. Done! 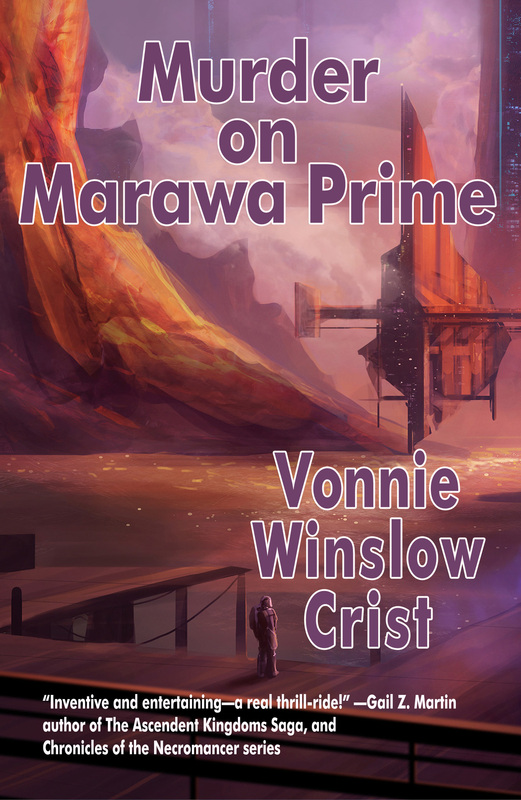 Murder on Marawa Prime was published by Pole to Pole Publishing in May 2016. If you like science fiction murder mysteries – this one is for you. 3-Revise and add another story and poem to my fantasy story collection, The Greener Forest, so it can be re-released with a new cover, etc. Done! Now, all that’s left to be done are to get some cover comments from fellow fantasy writers. 4-Finish at least 2 short stories and submit them to publishers. Done! I await the editors’ responses. 5-Finish crocheting an afghan for youngest grandson. Done! (greens, blues, and black) Plus, I finished crocheting an afghan for my oldest grandson, too. (reds, blues, and black) Both were given to the boys earlier in June. 6-Went on a 2 week RV trip to see a niece and her husband in Indiana; visit Lincoln country in Illinois; see Mark Twain sites in Hannibal, Missouri; visit Lewis & Clark sites in St. Louis, Missouri; visit Graceland in Tennessee; visit Shiloh Battlefield in Tenn.; see Ruby Falls & Cave and Look Out Mountain in Tenn.; visit Chickamauga Battlefield in Georgia; visit godmother in Greenville, South Carolina; visit uncle in Sparta, North Carolina, see sister and brother-in-law in Staunton, Virginia; and get back to Maryland in one piece. Done! 1- I haven’t gotten all the letters home from World War II from a great-uncle typed, or begun research for this nonfiction book. 2- I’m still polishing one story for a publisher, and working hard on another for a science fiction anthology. I’m hoping they’ll both make it to the Table of Contents. 3- The embroidered samplers still await their borders and framing – though I have gotten out the fabric to finish the projects. 4- The black and white drawings await their scanning. Why is this not done? I want to make a few changes in each drawing. Where do I go from here? Set goals for June and July, of course! 1- send in a final version of a story I’ve been working on since last June! 2- send in the first draft of a science fiction story to an anthology. 3- type at least 10 more letters from World War II. 4- add borders to and frame one of the samplers. 5- put a border and backing on a vintage redwork quilt top which has suddenly become mine. (More on this unfinished project later). 1- send a final version of the science fiction story to the anthology. 2- begin reading books to prepare to submit to another anthology. 3- type 10 more letters from WW II. 4- revise my science fiction and fantasy collection, Owl Light, in preparation for re-release. How about you? Are you trying to finish up unfinished projects, too? Any tips for me? Happy April Fools’ Day! One of my not-so-foolish goals for 2016 is to become more productive. For me, I know my productivity is hampered by my lack of organization. In other words, I need to get rid of the clutter (both literal and figurative) and focus. Even as I type this, it feels ambitious, but I think I can manage. I came across an interesting article on becoming more productive by Lisa M. Gerry: Three Ways to be Instantly More Productive in which she enlists the help of The Power of Habit author Charles Duhigg to share 3 tips for becoming more efficient. Here’s the link. How about you – do you have any other ideas for increasing productivity?